I have been working this past week on a home that is undergoing a major remodel. The place was totally gutted and redone. 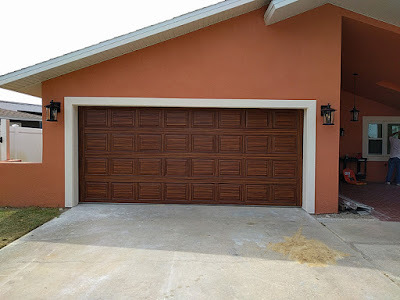 Part of that process was to get a new garage door. 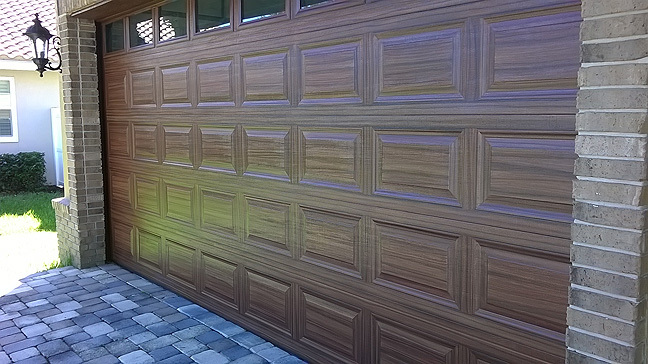 Then I painted that garage door to look like wood. I sell a complete tutorial on how to paint your common garage door to look like wood. The tutorial is only ten dollars. 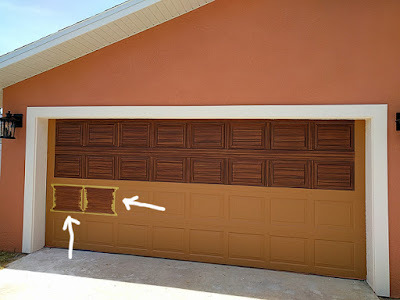 Just click on the Garage Door Tutorial tab in the top menu to find out all about it. 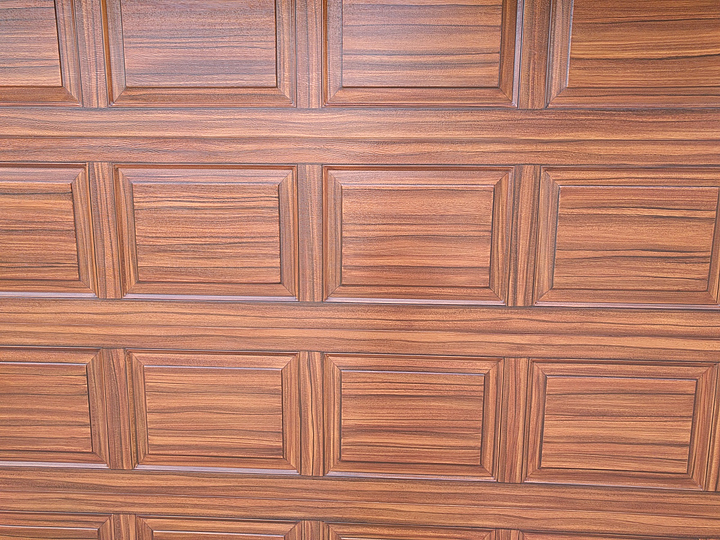 The first picture is the finished door. At some point the concrete driveway is getting replaced with pavers but that might be several months down the road. The wood tone color was picked to match the new color of the home. We wanted to make it compatible with the exterior of the home but still maintain an authentic wood look. The first picture was taken at the end of the day that I finished the door on. For most of the day the door is in direct sunlight. 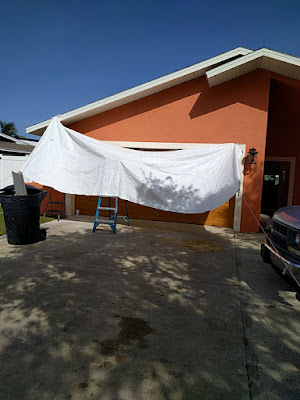 When I am working on a garage door in sun I have to put up my suntarp. 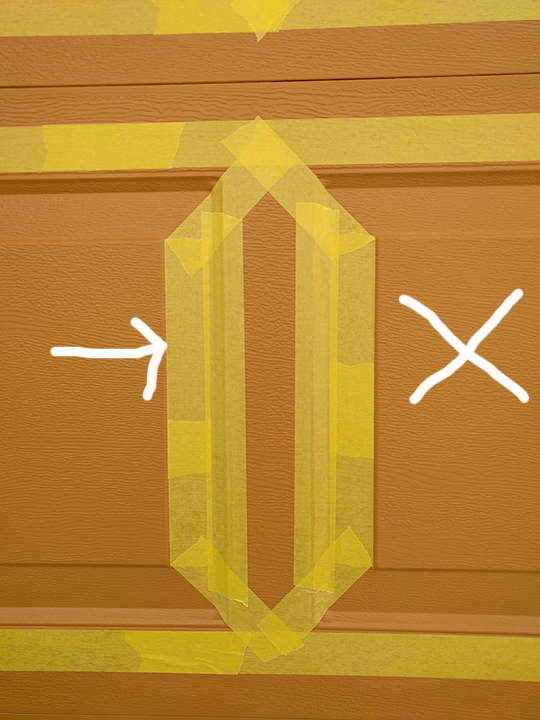 The paint dries way too fast to work on the door otherwise. 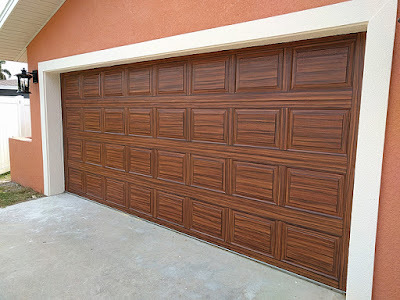 The first step in painting a garage door to look like wood is to clean the door very well. I use a scotch brite pad and soap and water and scrub the door down. 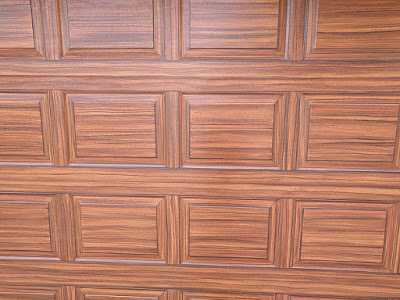 Even a new door needs to be clean like this. Then I prime the door and then once the primer is dried I apply the basecoat of paint. 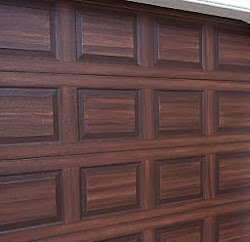 The color of the basecoat of paint is chosen based on the wood tone desired. So for this job I used a Sherwin Williams color called True Penny. This gives me the orangish color you see as the base coat of paint. 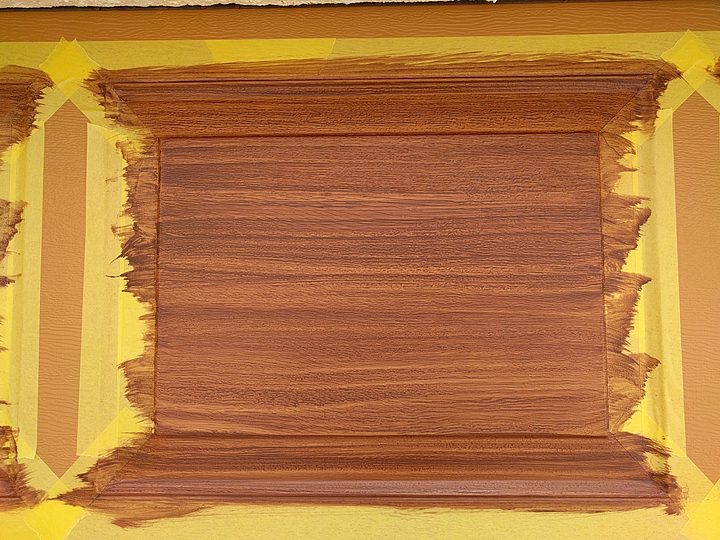 Once that base coat of paint dried over night I can start the wood graining process. The first step in that is to tape off the center panels like in the next picture. I typically work on two rows at a time. Each row has 8 panels in it. Once I get the top two rows done I raise the door and do the bottom two rows. 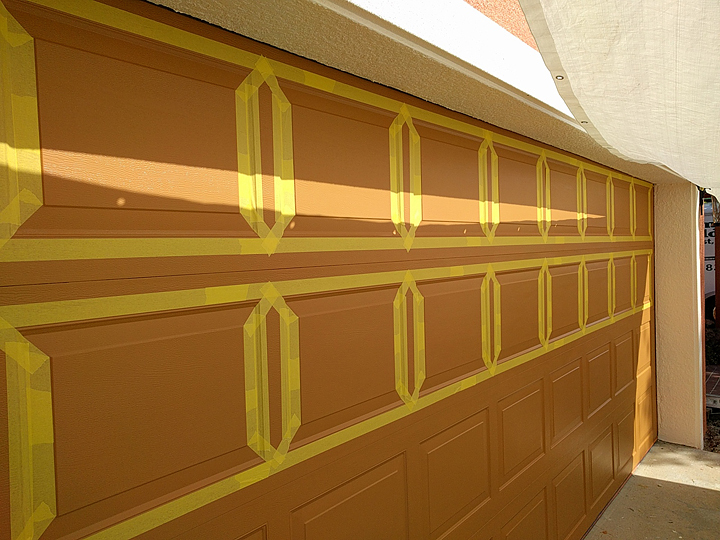 The next photo shows how I tape off the panels in each row. 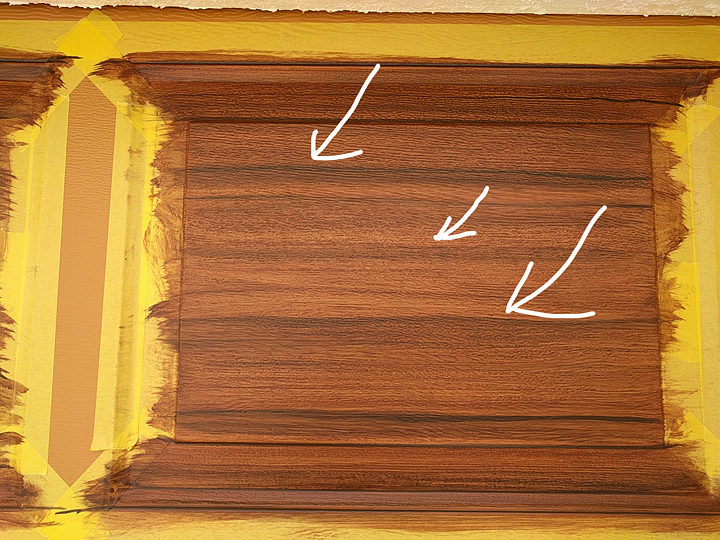 The x marks the center of the panel where I paint first. 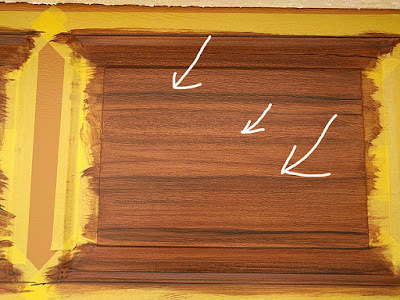 I want to isolate that area and not get any paint in the space between the panels because in the center of the panels I am going to paint it in with a horizontal wood grain pattern and between the center of the panels I paint it in with a vertical grain pattern. I double up the tape as you can see indicated by the white arrow. That way it gives me plenty of protection from any over brush marks. With this next photo you can see what I mentioned about brush overs onto the tape. I want to start each horizontal brush stroke on the tape and end it on the tape. That way when the tape is removed you have this clean line as you will see soon. 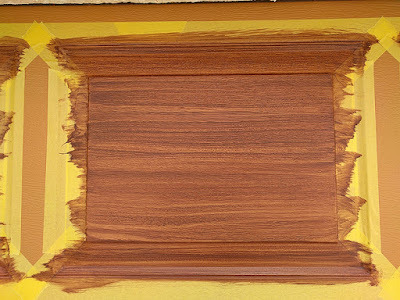 I use two colors to create the wood grain. The photo below shows the first color painted on. Keeping with the reddish Mahogany look I used a SW color called Fiery Brown. The second color for the wood grain I used SW Black Bean. 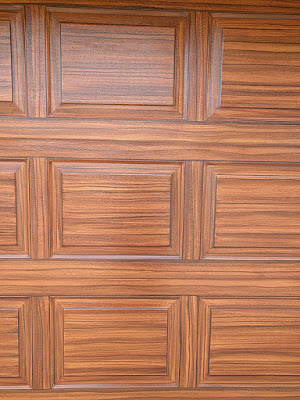 This gives me the darker grain lines and makes the wood look richer. The photo below shows the work done at the end of the day. I was able to get the top two rows complete and two panels on the third row. I always try to get the two panels done, with the first color only, on the next row before the end of the day. That way it makes it easier the next day to match up how dark I put on the first color brown. 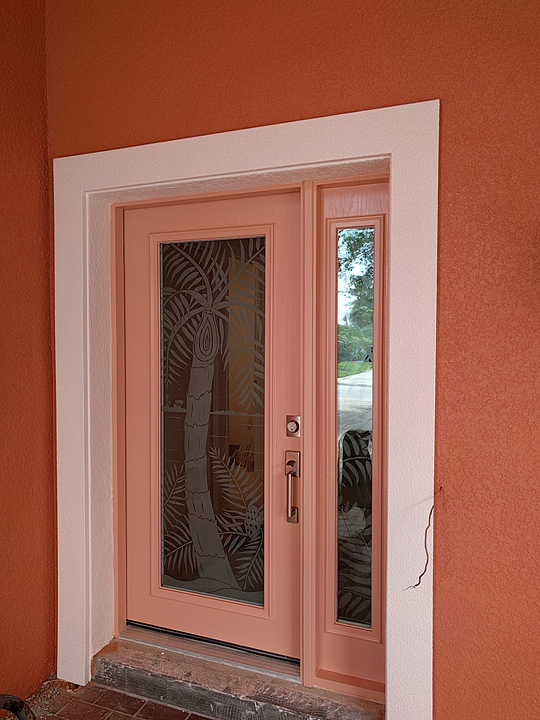 The next three photos show the completed door and some close-ups of the door. 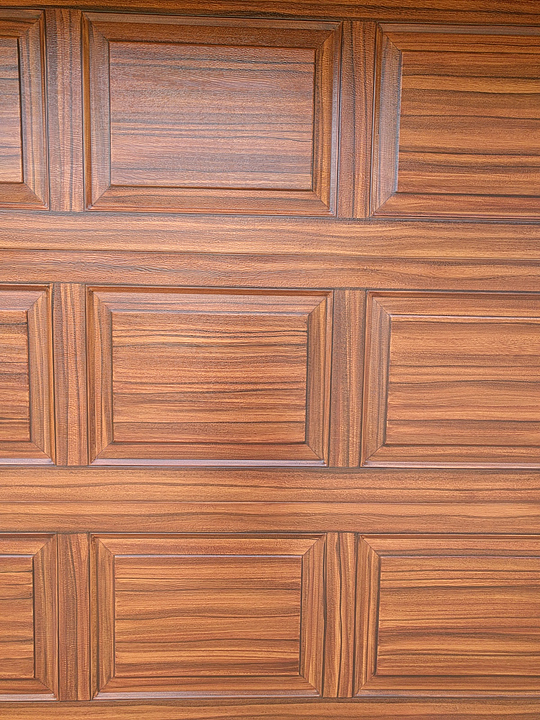 The door came out really nice and the clients loved it. 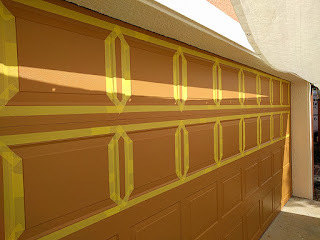 The second part of this job is to paint the front door and sidelight to match the garage door. I will working on that next. 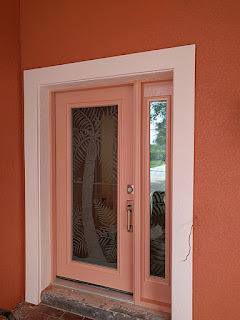 The photo below is the before pic of the front door.